Thanks to its unique production technology, for decades IVG has delivered products for the transfer of the widest range of fluids to offshore oil rigs. Hoses for diesel, barite, bentonite, drilling mud and petroleum products, all available in continuous lengths up to 120m (400ft). This unique production capability is of great help in reducing the number of the weakest links between tank vessel and oil rig. These lengths reduce the possibility of oil spills caused by incorrect crimping or disconnection of the assembly. The junction between more lengths is necessary whenever the single hose is in lengths shorter than the distance between vessel and oil rig. It also allows reduction of the total weight of the assembly. These products need to be assembled with specially designed floating collars to assure the assembly stays afloat even when transferring fluids with a specific weight of 2.0 or even 3.0 Kg/dm3. Since the nineteen nineties all the oil companies and the service contractors required the hose manufacturers to design the complete range of oil rig supply self floating hose in the longest possible lengths. IVG Colbachini is proud to announce that it is now able to offer the complete range of OFFSHORE products shown in the IVG Industrial hose catalogue, both for delivery and suction and delivery application, with integrated buoyancy layers in continuous lengths up to 110m (360ft) on diameter up to 4”. 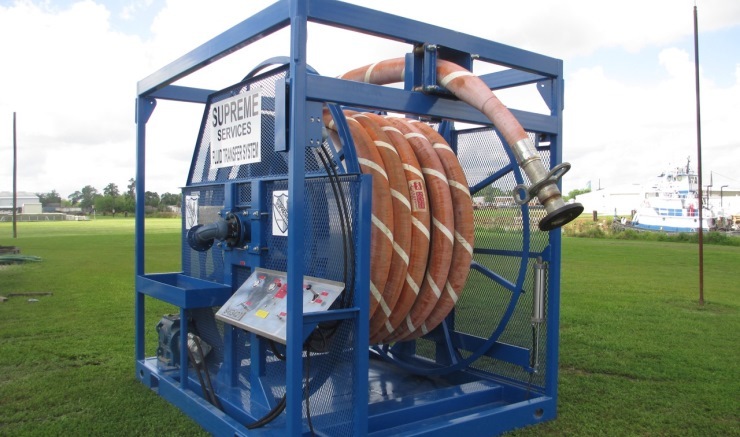 Just for handling reasons, the sizes 5” and 6” of the suction and delivery products can be shipped in maximum lengths by 60m (200ft). The products are available with different configurations, according to the enquiries received. The complete range of products is available with black or orange cover, but in order to increase the visibility during the night the floating sections can be covered with a special fluorescent rubber.